Machine yields precise portions per your input: simply select how many wedges you want the wheel cut into or the weight you want your wedges to be! 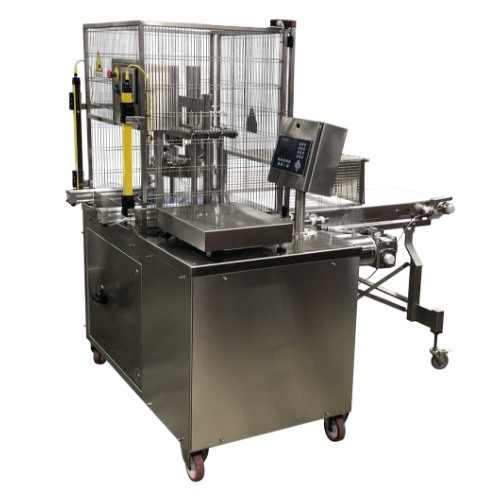 Get exact weight wedges from your cheese wheels by utilizing these compact, stainless steel electro-pneumatic machines. 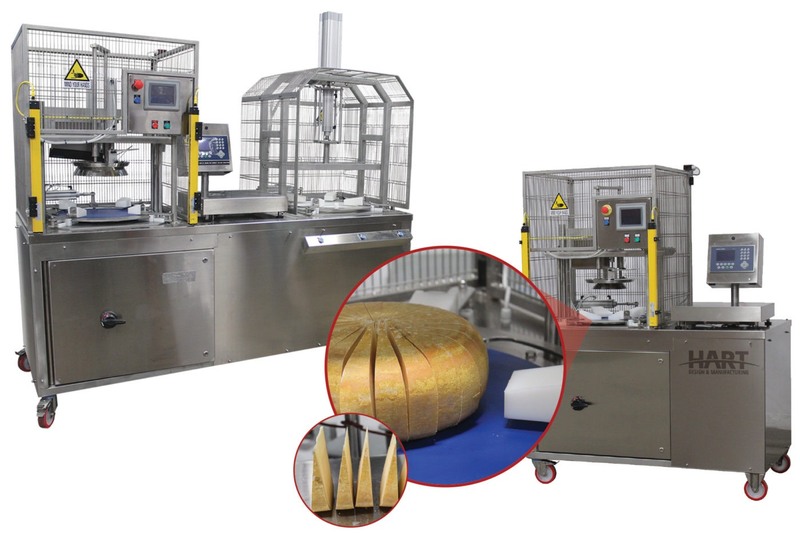 Semi-Automatic Exact Weight Wedge Cutting Equipment from HART can easily pre-weigh, center, stabilize and precision cut cheese wheels (from hard Parmesans to soft blues). See HD-PR01 Soft & Semi Soft Cheese Tests Here. Maximize yield and minimize giveaway! Experience less trim (waste) when using a Programmable Rotary Portion Cutter – because the cutter is not restricted to making an even number of cuts, there is a greater range of wedge weights. Centering arms position the cheese, centering cone lowers to stabilize and center the cheese during cutting. A blade then performs the operator’s pre-programmed series of individual radius cuts where blade is aligned to the center point, cutting the radiuses of the cheese wheel (i.e. the circle). 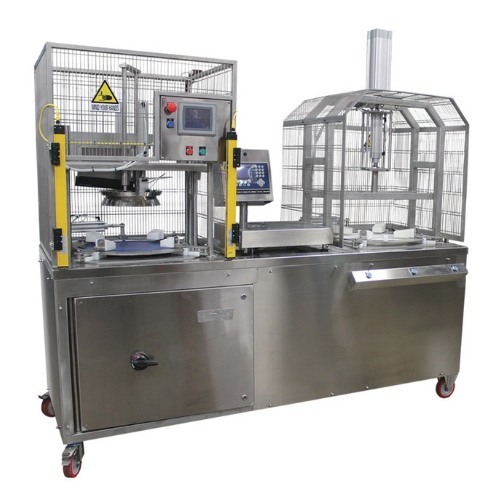 Ergonomic machines come equipped with standard safety features, including an emergency stop button and a physical cage guarding the cutting bed with only one access point which is protected by safety light curtains. Equipment programming reliably and cost-effectively protects personnel from entering the hazardous cutting area; when cutting, the blade will stop if an object enters the safety light curtain. HART helps you keep your personnel safer while enabling them to cut perfect portions every time. Ready for a great solution? Our 40,000 square feet of integrated production facilities, located in Green Bay, Wisconsin, allow us to provide our customers with superior design and engineering, machining, welding, fabricating, mechanical and electrical assembly, testing and programming, all under one roof! 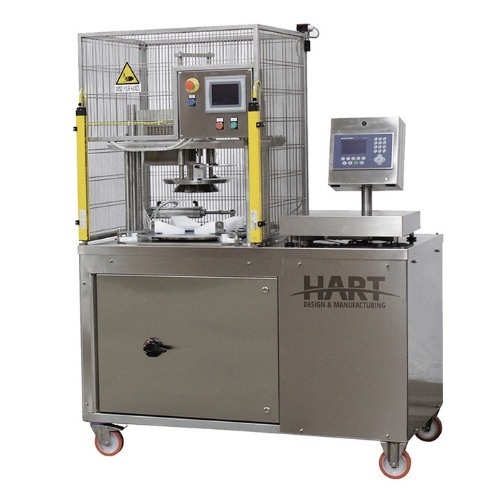 HART Design & Manufacturing uses proven technologies coupled with continual innovation to produce robust, reliable equipment to satisfy our clients’ specific processing or packaging requirements. Subscribe to our monthly newsletter to discover the latest & greatest videos, news and deals!